Speaking at the Salesforce Dreamforce conference in San Francisco, Instagram’s brand development lead, Patrick Workman, said that when the world’s second-largest social media platform first rolled out its advertising business, it started on a very small scale, reviewing every piece of creative to ensure it was native to the experience but also added value to what the users were experiencing. In the past 18 months, Instagram has launched over 400 campaigns and Workman claimed 97 per cent of these had seen a significant lift in ad recall. “This is partly because of the immersive experience of seeing your Instagram feed and that it is easy to stand out on the homepage,” he said. The company is now looking at further ways to provide more targeted advertising opportunities to brands based on its connection with parent company, Facebook. According to Workman, the key to leveraging Instagram as a marketing tool is not only about creatively capturing that perfect moment in time, but finding ways to express your brand’s point of view visually. “What we ask our advertisers to do is think about how you want people to really feel about your brand story and create and share images that can visualise that point of view,” he said. Another brand successfully leveraging Instagram is Mercedes-Benz, which promoted a new entry-level vehicle by utilising the hashtag #thingsorganisedneatly. The campaign asked people what they would pack on a weekend road trip in the back of their car. Creatives are also challenging what can be done on Instagram, Workman said. One example is Jameson, which used the border and auto-video functionality to create a 3D moving graphic of a drink being passed to a consumer through their phone. A new swiping mechanism also allows brands to tell stories through images in more engaging ways. “These new functionalities all give the ability for the customer to learn more about you, and for you as the brand, to really be able to tell a story throughout a new and exciting concept,” Workman said. Having chalked up such positive responses, Instagram is now going full throttle in launching direct response advertisements on the platform, Workman said. “We want to ensure marketers reach their unique objectives,” he added. “Whether it is driving traffic to a website, increasing mobile app activity, or get video views, we can do that. We have also made it easier to purchase through our advertisements directly. With more 300 million users worldwide, Instagram has become a digital must for consumers look to capture and share life’s moments. 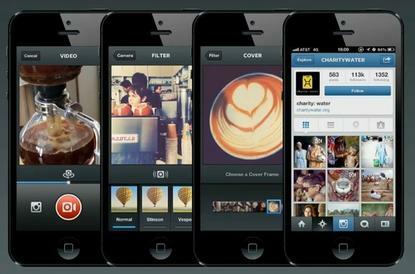 Every day, users upload about 70 million pictures generating over 2.5 billion likes. Specifically, Workman said 61 per cent of young millennials in the US access Instagram seven times a day. Instagram is also seeing its global footprint increasing substantially, with more than 75 per cent of active monthly users residing outside of the US. “According to Nielsen, 1 in every 5 minutes spent online is either spend on Facebook or Instagram, so to put it in perspective, that time spent is greater than the other top 10 mobile social platforms combined,” Workman claimed.